For over a decade, Brendon Burchard has been the world's leading high performance coach. In this capacity, he has been observing and recording his clients' and students' struggles and breakthroughs in personal and professional improvement. In 2009, he began training thousands of people per year on the topic of high performance and conducting before and after assessments with students from his online courses and workshops. 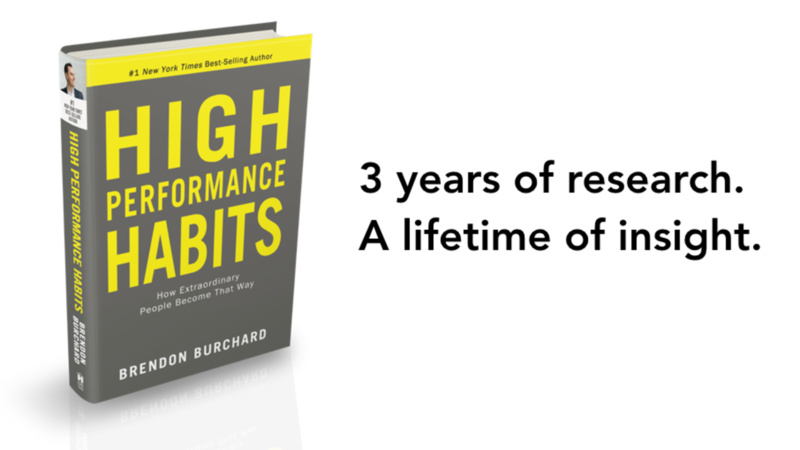 Hundreds of events, dozens of major surveys, and over a million online students later, he decided to formalize his research approach into what would become the basis for High Performance Habits. Armed with years of professional insight into how his clients and students attained high performance, Brendon sought to broaden his perspective by conducting academic literature reviews and hiring third-party researchers to help him test and validate his high performance trainings and assessment tools. Here are two results of those efforts. Academic literature review. You can download the entire bibliography from Brendon's book here. Many of these studies shaped Brendon's approach or supported his hypothesis. Validated assessments, methodology reports, and empirical testing. HPI has conducted or commissioned almost a dozen surveys of large audiences (all above 3000 participants) in order to validate the High Performance Indicator Assessment, a tool Brendon helped create and actively uses in his own career and research. We've measured over 100 performance variables and six habits consistently are found to strongly correlate with long-term success as well as happiness, income level, GPA, and more. Our findings have shaped the latest version of the High Performance Indicator, which is now used by major organizations to assess the long-term success potential of their employees. This summer, we completed an academic methodology report of a shortened, non-commercial version of the HPI and will be releasing the report to the public on the HPI website when published. Brendon used the commercial version of the HPIA for surveying over 30,000 people across 190 countries in the first round of his research for High Performance Habits. With the literature review and validated assessments, all pointing to the strong correlation of six specific habits with long-term success, Brendon and member's of HPI moved on to Stage Three. Armed with the data from our worldwide surveys, Brendon sought out the top 15% of the highest scoring subjects worldwide. He created additional surveys for them, and then conducted over 100 structured interviews with subjects seeking additional insights into their mindset, behaviors, relationships, career strategies, productivity tactics, and more. He also dug deep in conversations about the six high performance habits identified from Stage Two. To read a sample list of the questions he posed, see his chapter excerpt here. Finally, Brendon sought to find the themes that wove throughout the data and structured interviews, looking specifically for practices that seemed to create, shape or strengthen the high performance habits. He also sought additional support in academic literature reviews with the HPI team. All the while, he was writing and the team was validating the conclusions in large-scale surveys and assessments. As of today, over 50,000 people have taken the High Performance Indicator and the data shows that the six deliberate habits identified in the book continue to strongly correlate with high performance and positive life outcomes like happiness, positive relationships, and good health practices. Today, Brendon is leading HPI in collecting additional insights and articles from worldwide researchers and authorities on human psychology and performance. His goal is to extend the high performance conversation well beyond his own works. See our growing roster of contributing researchers, psychologists and performance practitioners and how their findings are supporting and expanding our understanding of what it takes to reach high performance in all areas of our lives.